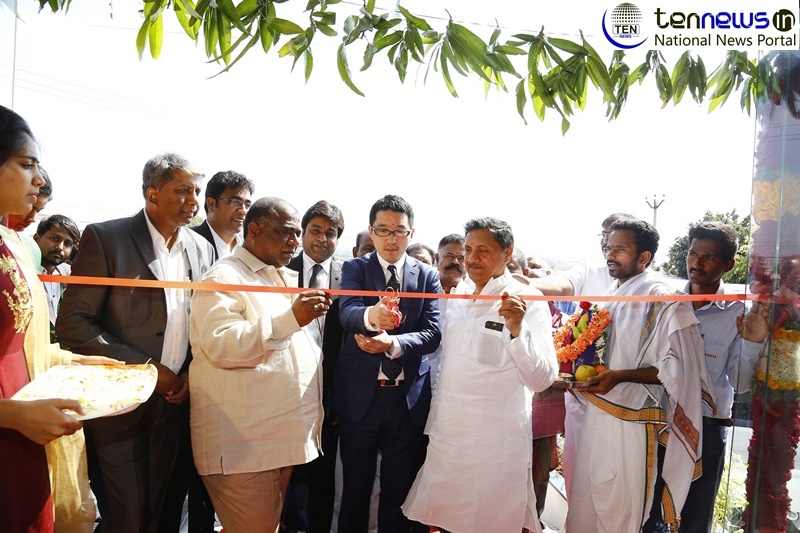 India, (30/11/2018) : Isuzu Motors India continues to expand its network in Andhra Pradesh with the inauguration of Sasya Automotives’ new flagship 3S (Sales, Service & Spares) outlet in Kurnool, today. The new facility, located on NH-44, spans across 12,000 sq.ft. and has a full-fledged body shop and paint booth facility to provide seamless service to customers in the region. The new outlet in Kurnool becomes the 2nd ISUZU outlet of ‘Sasya Automotives’ and 7th dealer touch-point of the brand in Andhra Pradesh. The other outlets are located in Anantapur, Nellore, Rajahmundry, Tirupati, Vijayawada and Vishakhapatnam. Customers can enjoy a 100% Motor Vehicle Tax Exemption across models and variants, purchased and registered in Andhra Pradesh. Isuzu Motors India launched the range of ISUZU D-MAX Pick-ups and new ISUZU mu-X, a premium 7-seater full-size family SUV in the presence of the management officials from ISUZU & Sasya Automotives to mark the start of sale from the new outlet. The new 3S (Sales, Service & Spares) facility of ISUZU in Kurnool is spread over a total area of 12,000 sq.ft (showroom & service facility) with a dedicated body shop and a paint booth. It has been designed and built according to ISUZU Dealership Standards, located conveniently to provide easy access to customers. The dealership employees have been trained under the supervision of ISUZU personnel and will provide quality customer experience. ISUZU D-MAX Regular Cab: The ISUZU D-MAX Regular Cab, a single cabin pickup, is a tough, powerful and reliable workhorse that is globally known for its performance and life-long durability. The Regular Cab is available in both flat deck and cab-chassis variants. The flat deck variant excel in meeting the wide range of applications in commercial transportation, while the Cab-chassis variant is an ideal choice to build reefer containers for cold chain transport applications. The Cab-chassis variant can also be customized for special purpose applications in the logistics and allied businesses. ISUZU D-MAX S-CAB: The ISUZU D-MAX S-CAB, a 5-seater Pick-up, offers a unique combination of Space, Performance and Strength in Smart proportions. It caters to the modern businessmen and professionals who seek high level of sophistication, space. The S-CAB is now also available in a Hi-Ride variant, which provides a higher ground clearance required for travelling smoothly over challenging roads. The S-CAB is also ergonomically designed and offers superior features for safety, comfort and convenience for the modern Pick-up driver. ISUZU D-MAX V-Cross: The ISUZU D-MAX V-Cross is India’s First Adventure Utility Vehicle, and caters to those SUV buyers who seek adventure and want to stand out among their peers. The V-Cross comes with a highly capable 4WD, modern SUV features and a large deck. Available in High and Standard grade variants, the new V-Cross comes with additional features such as – Electronic Stability Control (ESC) with Traction Control System (TCS), Auto Cruise Control, Daytime running lamps (DRL), LED Tail lights, Rear view camera, 2-Din touchscreen entertainment system and Side-step. ISUZU mu-X: The ISUZU mu-X is a premium 7- seater full size SUV designed to offer the best of both worlds – All Muscle and All Heart. It is a perfect combination for those buyers who seek not only style, power and a dominating road presence but also want to have the best-in-class space and comfort for their family. The new mu-X comes with refreshed exteriors (front & rear), exuding more aggressive stance, premium ‘Lava Black’ interiors, additional safety features including 6-Airbags (front, side and curtain), Hill Descent Control (HDC) and 18-inch multi-spoke twist design diamond-cut alloy wheels making the SUV more sporty and muscular. The ISUZU vehicles are attractively priced with the ISUZU mu-X (4X2 variant) at ₹ 26,25,779/-, V-Cross (Standard) at ₹ 14,77,464/-, D-MAX S-CAB (Hi-Ride) at ₹ 8,96,046/ – and D-MAX Regular Cab Flat Deck at ₹ 7,27,963 /- (all prices, ex-showroom – Kurnool).